I wanted to comment in my blog on bad stuff that has been happening to me since I found out in February 2013 that I have celiac disease. I use the usual sort of personal care products like soap, shampoo, moisturizer, lip gloss, etc. and keep finding that some of them have wheat in them. And then I eat foods that I never even think of wheat in connection with but find they have wheat as an ingredient! It is very easy to forget to check and next I know I am feeling just terrible. Wheat is in many things that I just don’t expect it to be found in. Foods like Campbell’s soups including the basic tomato have wheat as a thickener and chicken broths for the most part have wheat products in them. Many seasoning mixes that you buy in a spice jar have wheat included. I got sick this weekend from some rotisserie chicken bought at Weis Market. Barbeque sauce, soy sauce, oyster sauce and a host of other sauces contain wheat, even my Japanese mirin sake for stir frying. Some wheat products have odd names or are by-products so if you are not wary you find that wheat has crept into what you are consuming…. The issue of personal care stuff is particularly devious. You don’t have to ingest them just use on your skin and you get sick if there is wheat in them. There was that facial moisturizer from CVS; definitely wheat: I got sick on July 4th from it. No wheat product on the ingredient list either. I had a skin cream I loved; full of wheat – had continued to use it for a while before realizing it contained gluten. My sister says her bathroom liquid soap has wheat in the ingredients; she is getting another kind for my upcoming visit. Sadly, personal products like soap, makeup, moisturizers and the like don’t have to even mention wheat as an ingredient. So you often can’t tell you have been glutened until you feel ill after using them. That makes buying many things at the drug store very chancy. I now hesitate before replacing anything I use on my body unless I am sure it will be safe. That brings me to my third point. I have been wheat free a bit over five months so I am just learning all this stuff. I used to scoff at the idea of getting sick from a touch of wheat. I thought I just needed to avoid it as an ingredient in my foods like no more wheat pasta, no barley soup and no wheat or rye bread. I now know better, that any tiny bit of wheat has the real potential to make me feel terrible. So I understand that it is hard for those who are not suffering from a wheat allergy to understand how pervasive it is and how important eating gluten free is to the health of a celiac sufferer. Hence this posting. Now on to general politeness…. I read snarky comments by people implying that I have horrific diarrhea and other socially unmentionable symptoms! It is really rude to make such insensitive comments. The reality is that there are over 200 different reactions that people with celiac have to gluten. It is a severe allergy but people have a wide variety of reactions. I personally feel a burning pain over to the right of my stomach where my small intestine is, I feel exhausted to the point that I sleep for hours and I am very thirsty and somewhat nauseated. They are real symptoms, not imagined and I have them every time I ingest gluten by accident. Other people have their own, very real, symptoms and people should not minimize or mock them as I have heard in the past months. Celiac disease is a severe allergy to all gluten products. It is not an optional choice to avoid wheat. It is vital to good health as gluten can cause a wide variety of severe health problems for celiacs including cancer. Don’t be ignorant in how you treat people with allergies like mine. These allergies are real problems and we celiacs deserve polite verbal responses and well thought actions that will help us avoid a health crisis. It is not a minor thing for us nor is it fair to say we celiacs should never eat out! Every one needs to celebrate once in a while for someone’s birthday, or at a wedding or such. We all have reasons why we are away from home and must eat in a restaurant. So if you are a waitress, chef, salesperson, restaurant owner or otherwise come into contact with individuals who advise you of their wheat allergy or say they have celiac disease, please take that seriously and do your utmost to give them what they need, a safe meal with no gluten what-so-ever in it. Even a tiny pinch or dusting of flour can make them sick. If you sell skin care items or other personal care products, know whether they contain any gluten so you can answer questions like the ones I need to ask. I don’t ask to be a pest, I ask because it is very important to my health. Plus, now you know how to treat someone in your family if they are diagnosed with celiac: with extra care and with understanding of the serious nature of their illness. People who have celiac deserve to be treated respectfully and with real concern for our need to remain wheat free. It is not always simple to do but is very important for our health. So be kind, be careful and be polite to anyone with a serious allergy like I have. They will thank you for your caring – you will feel good that you did the right thing and helped them maintain a difficult but necessary diet. Sometimes I crave sweets, especially dark chocolate and sometimes I crave fruits or vegetables. Once when I was visiting my sister Margie for the weekend she served a mixed green salad with a snappy vinaigrette that had some Dijon mustard and was just delish. We both enjoyed it so much we had seconds instead of a dessert! If you live salad maybe you would like my new favorite spring salad. It is flexible so put the greens in that you love. But one caveat, no iceberg lettuce, please. It has minimal flavor and is the wrong texture for this spring salad. Not to mention that it is seriously lacking in nutrients. So, to create my special Easter salad, I got a box of cleaned and washed spring greens from Valley Farm Market in Bethlehem, full of tiny leaves of a variety of lettuces as well as beet and spinach leaves. I also got some sugar snap peas and a bunch of radishes from there. The produce is very fresh and of outstanding quality at Valley Farm, located on Stefko Boulevard. This bunch of radishes looked just picked and still had the greens attached. I washed them and cut the root tail off and the stems. I cut each into ¼ inch rounds. I cut the pea pods in half and steamed the sugar snap peas for 3 or 4 minutes, removing them from the heat just before they were done so the pods still had a bit of snap to them. I drained them and put them and the radishes in a dish and refrigerated them for 30 or 40 minutes until they were really cold. 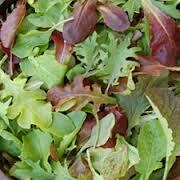 The greens were washed, dried in the salad spinner and placed in a large salad bowl. Mine is translucent plastic from Target, nothing fancy! Toss in the chilled snap peas and the radish rounds. Then sprinkle with your favorite vinaigrette dressing. Here is my basic vinaigrette recipe. You can alter it to your tastes and leftovers keep for several weeks in the fridge. I use one of those Good Seasoning’s jars but add my own ingredients. Fill it to the vinegar line with red wine vinegar, not the cheap store brand (skimpy 1/4 cup). Then some filtered water to the water line (about 1/3 inch more or two tbsp.). Next I add ½ tsp Dijon mustard, ½ tsp sea salt, a ¼ tsp dried thyme, one garlic clove (peeled and mashed down a bit to release flavor), 1 tsp mayonnaise, ¼ tsp freshly ground black pepper and ½ tsp sugar. Then top off with some extra virgin olive oil, stop a bit before the oil line and finish it with lighter olive oil (1/2 cup plus one tbsp of olive oil). Shake it up really well. It tastes best at room temperature and marinate it all put together for at least an hour before you use it the first time. Keep in the refrigerator if there is any left over. The mustard adds snap and the bit of mayo helps the dressing stay emulsified (fully blended) longer than it would without the mayo. You can guild the lily with some freshly grated Parmesan cheese if you like. This is a light and delicate salad that will complement any number of main dishes like pasta, roasted meat or fish dishes. As I said, you can swap out the peas or radishes for other veggies like raw zucchini, carrot rounds or whatever floats your boat! I like to choose things that look fresh and are in season. Don’t put too much of any one veggie in; you want them to be like treasures to be discovered in the nest of fresh greens you have lightly coated with a tasty vinaigrette. Be creative and have fun making fresh, healthy and yummy salads that will round out your meal and keep you feeling great! Yes, Your Make-Up Needs to Be Gluten Free Too! Yesterday morning I put on some facial moisturizer with sun screen built in before leaving to meet Joe for a hike. This was a 15 spf specifically for use on the face. After a few minutes I started to feel sick….and sicker. I went over everything I had eaten or touched that morning. Every food I ate was clearly GF. This was a new facial moisturizer I bought at CVS, and it was the store brand. It said it was for sensitive skin. I read the ingredients before buying it. No wheat mentioned. I read the list again last night, no wheat or starch or anything that would clue me in to the presence of wheat. But yet, it was what made me feel sick all day yesterday. Before my diagnosis in February 2013 I would never have dreamed that wheat was in makeup, soaps and other personal products nor that it could make me feel quite sick in such small amounts. I can understand why people are skeptical about the fanatical nature of many celiac sufferers. I felt that skepticism until I began to deal with this myself as someone terribly allergic to wheat. A few months ago I had to give away or throw away a number of skin cleansers, creams and the like that stated they had wheat in them. I thought I had gotten rid of all that wheaty stuff in my personal care regimen. So….after feeling sick about an hour we got to our hiking location, there I put a 50 psf sun block on the rest of me. After that I didn’t get worse and slowly over the course of the day I felt a bit better each hour. Today it is 90% gone. Still, that was not a fun way to feel for the Fourth of July. I went back to CVS today and returned the moisturizer. I looked at what they have available in daily moisturizers. Many choices but I honestly couldn’t tell from the labels whether wheat was in any of them. Nothing said GF on the packaging. So I went home and checked with my friends at the Lehigh Valley Chapter of the National Celiac Sprue Association; I am friends with them on facebook. They gave me some personal recommendations and directed me to this website: http://www.theceliacdiva.com/gluten-free-face-moistrizer/. This site looks to have a lot of valuable information on this topic and with their comments I feel I may be able to find something that works for me and doesn’t cost a small fortune. It does shock me at how easily a tiny bit of wheat in a moisturizer can make me feel really lousy. I wrote this posting so you wheat eaters might have a bit more insight into what it is like for those of us with celiac disease. We are not trying to be difficult when we ask wheat related questions. We are just trying to stay healthy and feel good while going about all the daily stuff life entails, like putting on moisturizer, washing our face and eating healthy foods. Originally posted in early July 2013 I plan an update to this posting within the next week to let you know what I have learned in the last few months about gluten free cosmetics . A Spring Pie to Remember and Pretty Easy Too! Today is Easter, the day of baked ham, chocolate candies and hardboiled eggs… We did the ham, the toddler had some chocolate and we enjoyed doing an egg hunt for him after lunch. But, I wanted the lunch dessert to be special yet not too heavy or fattening. I wanted an attractive pie, with fruit in it and was hoping to make something easy. A tall bill to fill for sure. Upon some reflection I remembered a family dessert from a few years ago. I am not sure why I stopped baking it other than I am gluten free and my dieting sisters balk at heavy cream in any recipe. It was not that fattening if you look at just a slice, not the whole cup of cream in the pie! My sisters forked it down as they are cherry lovers, my aging mom ate every scrap and the kids were happy to eat large slices. So I thought I should share it, you can make it anytime you want an easy company dessert. I like it in the spring, seems somehow appropriate and there isn’t much fresh fruit available to make a decent pie. You could make it the night before or early in the morning. I did it this morning before church and it was chilled enough to eat by 1 pm. Gently spoon the filling into the pie shell, spread it out to fill the entire bottom. I used a spoonula (blend of spoon and spatula) and smooth the top with a flat cake spatula. I like to leave a sort of tiny ridge on the outer edge to keep the pineapple from spilling out onto the crust. Then carefully pour the rest of the cherry pie filling in the center spreading it to cover ¾ of the top from the center out. 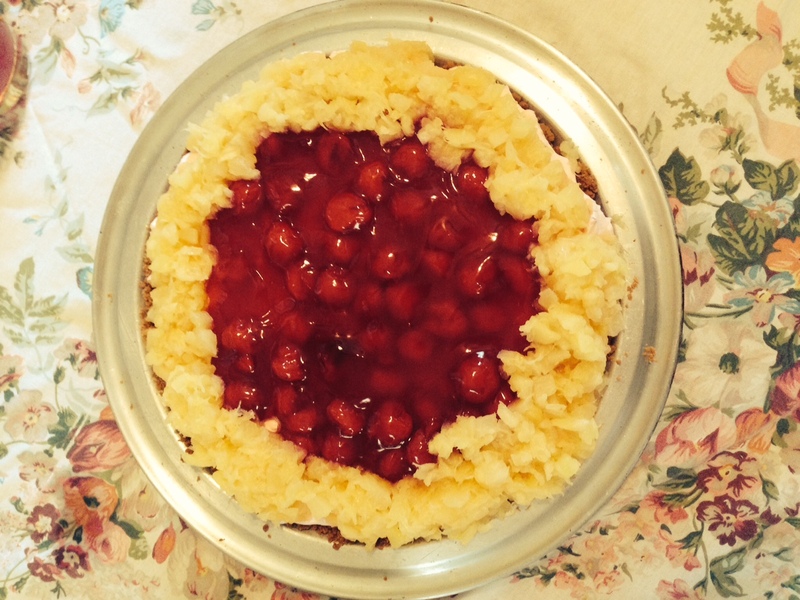 Finally, use a spoon to put clumps of pineapple around the outer rim of the cherry filling. Chill at least 2 hours, preferably 4. Cut and slice. No adornments are needed. It has a light fluffy consistency and it isn’t that sweet. Great to top off a big meal; not too filling and the fresh fruity taste is a spring treat. Try it soon and you will be giving the recipe out afterwards! Tasty GF Camping Can be Done! Camping can be fun and relaxing. We go most every summer. This is tent camping at a state park, a place with a real bathroom with running water! You park your car and empty it and set up the tent ten feet from your car. Picnic table and fire pit provided. But we cook all our food, no running out for breakfast at some local joint like many campers do….so GF cooking would be part of the deal. We went camping last weekend at a lovely state park; Ricketts Glen; incredible waterfalls to hike around! Some things were just as they normally are, like grilling proteins such as shish kabobs, baking potatoes in the camp fire, bacon for breakfast and lots of fresh fruit. But there were some GF recipe issues so I had to adjust some of what we ate. It wasn’t that problematic after all; more of an issue that one person did not eat meat so we had to segregate the bacon from the fakon – weird looking fake bacon that I did not try. Maybe it tastes good but I will pass! Before we went I did some thinking and some research on how to make my favorites GF. 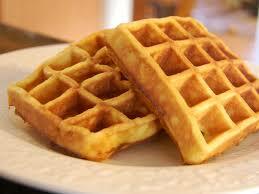 The usual buttermilk waffles I make in my antique cast iron waffle iron had to become GF. I found a recipe that seemed do-able; I made them up as pancakes at home earlier that week. But they were kinda stiff and dry. I had to re-think them. I had followed the recipe closely and it used water and buttermilk powder. I realized that real buttermilk would taste far better and buttermilk is a smart milk for camp baking. It is sturdier than regular milk and can exist in a cooler for 2-3 days and yet stay edible. And because waffles are naturally supposed to be crunchy, well the recipe worked very nicely. There is some cinnamon in them which helps with the flavor. And all four of us loved them especially someone who is a cinnamon freak! I brought some homemade grape syrup which was awesome poured on top. Breakfast waffles – GF, Check! And then there was protein; easy to do GF so I will not even get into a lot of detail there. Suffice to say marinated salmon steaks, potatoes cooked in coals, corn on cob in husk on grill top. MMMmm. We also did shish kabob which is also GF by nature. Just know that if you should need to flour any meat or fish, white rice flour works fine. GF Protein – Check! Sides: we had those baked potatoes and then the second night I made a wild and brown rice pilaf on the camp stove. Easy and tasty; I added a bullion cube, diced red onion and some dried parsley to it. I have also made quinoa on a camp stove, not hard to do either and it cooks faster than brown rice. GF Sides – check! And the most problematic item was the cobbler. We always have blueberry cobbler when camping as we both love blueberries and cobbler. But I had tried some GF cobbler/crisp recipes with no real success. The one I made this weekend was a muffin mix that said it could sub for a cobbler in a pinch and it was fantastic; light and fluffy and yummy. I pre-made the mix for the cornstarch and sugar to cook the blueberries in and I premade the cobbler mix (sealed in baggies with recipe written on the side with a black sharpie pen). We beat the eggs up as much as muscles could do and added that as well as a bit of melted butter and some buttermilk to the dry mix. Stir well and pour over the hot fruit; it had to cook extra long on the fire as someone wanted extra cobbler topping and it nearly filled the pan to the lid. We heaped hot coals on the lid and it finally completed the top layer. Next time I am not listening to him on that issue! GF Dessert – Check check! I should mention that on Friday night my best friend made a dump cake full of jam and chocolate, baked over the camp fire and served with whipped cream and Kailua. She used a GF cake mix. It came out sort of molten like a hot pudding. It was very tasty if kinda sweet. And it was so supportive of her to bake GF for me! So to reiterate: I found great easy recipes for GF waffles and cobbler. Both as good as any you will find made with wheat. We ate great protein and tasty sides. I did make sandwiches for lunch using some okay GF bread. I still haven’t found the perfect GF sandwich bread but someone gave me a new recipe I must try – she said it makes great sandwiches…. I live and hope for a success story on that item and soon as I really miss sandwiches and rolls. My friends did not mind eating my GF cobbler and waffles and it was not any more difficult to take with us or cook on open fire. So feel free to camp GF: if you want my waffle and cobbler recipes ask and I will post them soon. Peace and happy camping!! Originally posted June 21, 2013. I went camping again last fall and the waffles were fantastic. I have made that cobbler again and it works wonderfully with many kinds of fruit. And, I have a new favorite pancake recipe; I will post it soon. Ever watch Chopped on Food Network? I love that show. Each contestant gets 3-4 weird to normal ingredients that must be in their final dish. The dish must be tasty, look good and they have to transform the ingredients. I am fascinated by what they are able to create in a limited time. Check it out sometime. So, I often play my home version of Chopped. But I don’t limit myself to 20 or 30 minutes nor do I ask myself to radically transform the ingredients. My rules are that I must make something yummy for supper using ingredients I already have in my kitchen and at least 2-3 that I must include in that particular meal. Generally I have limited time to throw it together due to my hectic work schedule. So, sort of like a Chopped episode. At least I don’t have 3 other chefs there trying to out cook me! So I took the flour and put it in a large baggie, added the herbs, salt, black pepper. Shook them up and shook each chicken thigh in the baggie briefly to coat it. Heat 1 to 2 Tbps. olive oil in a large frying pan, when hot, add the chicken thighs. They should not touch each other. Cook over medium heat for 3-4 minutes on each side or until browned. I turn them with my old school metal tongs, the kind with the rounded ends, they look like weird scissors. Perfect for turning chicken pieces. While it browns get the veggies ready. 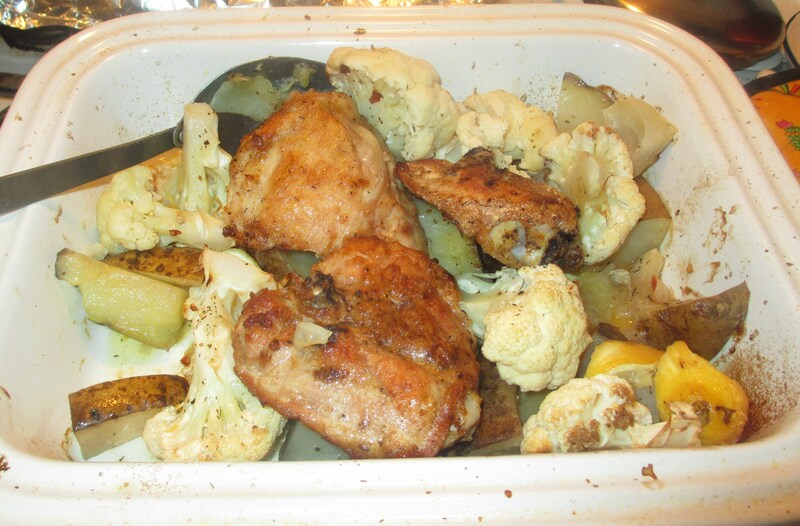 Spray a 9×13 glass or ceramic low sided casserole dish with canola or olive oil cooking spray. Peel and cut the garlic cloves in half, throw in. Wash and cut the potatoes into 1 inch wide wedges, cut them across into short wedges. Throw in. Cut up the onion into 1 inch long chunks, toss in. Toss in the cauliflower florets. Drizzle the rest of the olive oil over the veggies. Drizzle the juice of the lemon over it and cut up the lemon half and sprinkle small pieces on the dish. Sprinkle them with some more thyme; maybe another ¼ tsp. Sprinkle with more salt if you like and some fresh ground black pepper. Nestle the chicken thighs in there, pour the chicken broth over it. I had some homemade leftover from another meal and it was perfect for this, I even left the chicken fat in it for extra flavor. Cover the casserole with a sheet of aluminum foil. Bake in 375 oven for 45 minutes to an hour; until veggies are done when poked with fork and chicken pieces are also done; clear liquid only when pierced. Dig in and enjoy the subtle flavor of the lemon and herbs with the chicken and cauliflower along with the mellow flavor of the potatoes, onion and garlic. Simple and gluten free and a perfect meal on a chilly spring evening. Use your favorite gf flour for the chicken dipping. Most any kind will work. I am betting you could change out the veggies to suit what you have around the house. Healthy, tasty and cheap especially if you get the cauliflower on sale. I think I am almost ready for my Chopped episode!